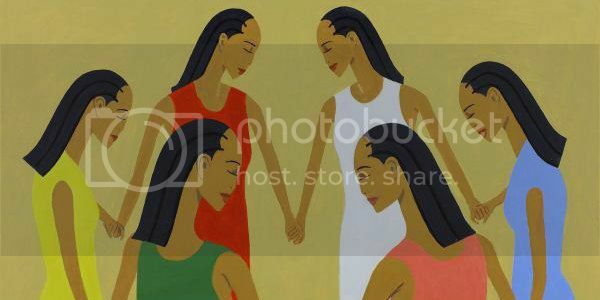 There are several female attitudes and tendencies that have caused many of us to question the prominence of sisterhood. Cattiness, backstabbing, and the unceasing need to constantly be in competition with one another are things many of us have experienced in our relationships with other women. I can fully understand why that sort of negativity would make one question the state of sisterhood however I don't necessarily agree that it completely undermines the kinship of sisterhood-- at least not for all of us. I've posted on both sides of the sisterhood fence. On one hand, I have managed to maintain strong relationships with women in my life that have lasted years. Relationships that have been uplifting, empowering and conducive to my growth as a woman. On the other hand, I have experienced the ugliness of cattiness, jealousy and backstabbing by women I have been close with. I've found myself feeling stupefied, betrayed and hurt. It would be easy for me to behave the way i had been treated or to become aloof towards women as a sort of defense mechanism but my instincts never led me to that point. I realized that sisterhood is what you make it. You create it by how you carry yourself and how you interpret certain situations. Not every woman you grow close to is meant to be a staple in your life. It's simply that some people come into our lives for the sole purpose of teaching us things we may not have learned otherwise. One of the most profound lessons I have learned is how to go about placing the people in my life. I've managed to condense my circle to just a few core friends while still remaining friendly and cordial to other acquaintances and welcoming new ones. This is something that has helped sustain my positive outlook on sisterhood. It would not be fair to treat my fellow woman impertinently because of my past experiences or to assume that what I have experienced is the norm for all women. Of course this applies to other life circumstances but I think it's especially important to hold this attitude towards other women because we need each other. For situations as dire as heart-rending breakups, exciting as becoming a new mom or as inconsiderable as bonding over natural hair products in the beauty supply store with a complete stranger, our sisters help to sustain us. The affinity between us provides us with a source we can always identify with. Finding sisterhood is simple. If you desire to have it, you have to embody it. (Tweet This!) Give compliments, show support, be happy for someone else's happiness. Let us not be so quick to own close minded ideals about other women and instead be the kind of women we would like to surround ourselves with.